In typical Tim Duncan fashion, the San Antonio Spurs legend didn't show up for his own retirement gathering (don't call it a news conference, because the Spurs didn't). Tuesday's official farewell to Duncan consisted of Gregg Popovich chatting with reporters gathered at the Spurs' practice facility. Pop was wearing a T-shirt with a picture of Tim Duncan and the words, "Impossible is potential." Here is a transcription of the event from ESPN's Michael C. Wright. Popovich: "He makes me wear these clothes. ... He gives me my paychecks, he might as well give me his clothes. "I'm trying to wrap my head around why I'm standing here and he's not. And we all know why. It's not Tim Duncan. We've been saying it for 19 years and he really only cared about doing the best job he could basketball-wise and being who he was for his teammates and being somebody who loved his family. That's really who he is. "So this is the furthest thing from his mind, so I figured I better come out and do this and somehow say goodbye to him, which is an impossibility for a lot of reasons. "I tried to think of how to compare him and what to say about him and I got a few thoughts that might be boring for all of you. You know everybody talks about who they would like to eat dinner with. You know, if you had one night to go to dinner, go to lunch with so and so, and people say, you know, Mother Teresa and Jesus and the Dalai Lama and, OK, I get it. But if you think about it a little bit more earthly, worldly type people, you know, people who are interesting, I think of people like William F. Buckley on the right and Gore Vidal on the left, when they had their debates -- some of you are old enough to remember that stuff -- really clever, insightful people, ideas that blow your mind and that kind of stuff. And I can honestly tell you [chokes up], my dinner would be with Tim Duncan, because he is the most real, consistent, true person I have ever met in my life. He was so genuine, it blows your mind, like Buckley or Vidal would in an avant-garde sort of way. "To spend time with Timmy is really sublime in many ways. People don't know about his cleverness. I think of people like John Cleese, clever, incisive, sarcastic. Nobody knows that about Timmy. I can be on him in a game and ask him why he is not rebounding in a relatively stern way, really get on him in front of everybody, and on the way back to the court, he'll say, 'Thanks for the motivation, Pop,' 'Thanks for the support, Pop,' and turn away with his eyes up in the air, and we'll both start laughing. People don't see those things, but his teammates -- and that's why his teammates love him, because he has been the best teammate anybody could ever imagine. 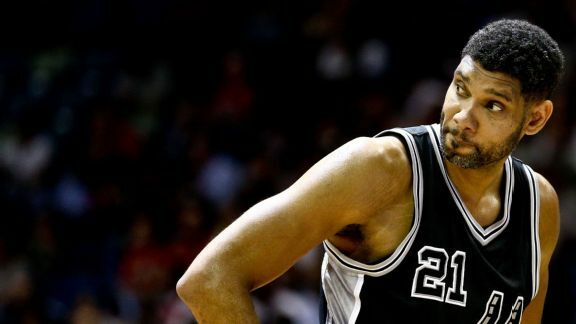 "Think about how many people have played with him, and all Tim Duncan has to do is raise one of those arms, right or left, and he puts it on their shoulder, and it's a warmth and a comfort they feel that allows them to become the best possible player they can be. We had a lot of players come through here and be successful and go on to other places just because Tim Duncan created that environment, so that whoever came through here, to be able to develop and create livings for their families, and we are all grateful to him. "It's not a show of humility in any sense or form. People who grew up with me know me. I would not be standing here if it wasn't for Tim Duncan. I'd be in the Budweiser League someplace in America, fat and still trying to play basketball or coach basketball. But he's why I'm standing. He's made livings for hundreds of us, staff and coaches, over the years, and never said a word. Just came to work every day. Came early. Stayed late. Was there for every single person, from the top of the roster to the bottom of the roster because that's who he was, in all those respects. "He's irreplaceable. It can't happen. We're all unique -- I guess each one of us is unique -- but he's been so important to so many people it's just mind-boggling. To think that he's going to be gone makes it really difficult to imagine walking into practice, going to a game, getting on the bus, taking him a piece of carrot cake, whatever it might be. "He's been true to himself. I read an article yesterday -- I don't do that very often because most of what you all write is junk so I don't read it much -- but this was by Jason Gay of the Wall Street Journal. He pretty much got it right on the head. I don't know how much basketball he watches or who he consulted for the article, but he was right on the money as far as Timmy's class and humility and consistency over time. "You don't see Timmy beating his chest as if he was the first human being to hug the basketball, as a lot of people do these days. He's not pointing to the sky. He's not glamming to the cameras. He just plays, and we've seen it for so long it's become almost mundane. But it's so special that is has to be remembered. "Jason Gay, this author of the article, to quote him, said he 'hid in plain sight' better than anyone he'd ever seen. And it's true. I tried to think of somebody like that. I'm a foodie -- a food and wine guy -- so the name that popped into my head was Anthony Bourdain. Nobody knew who the hell he was except foodies. Then he wrote his first book and became popular and all of a sudden he's on CNN, doing these travel shows. He's erudite and incisive and people love [it]. He's talking about the Ramones and he's talking about hooch and he's talking about food and everybody says, 'Who is this guy?' And he's been there all along. You just didn't notice him in the beginning. "Well, it's been that way with Timmy, the greatest player at his position ever to step on a court, and now people are saying, 'Oh, yeah.' That kind of thing. Timmy doesn't care. "Did you also read the WSJ piece about the social psychology paper that Tim wrote while a junior at Wake? "Yeah. We all know Timmy is a grad, but he took his education very seriously. It's something he relishes and is very proud of. But at this point I can tell you that thing that made him the happiest -- I'm speaking for him now and I don't know how accurate -- but I think the thing that made him happiest, beyond the fans and his teammates, was the time he spent with his two children on the bench before games. That's who he was and that's who he still is." Question: A lot of teams that lose a superstar are left with a big reconstruction period. The Spurs are not in that spot. How much has his unselfishness, as far as salary, helped with that? "Timmy, along with other people, Many [Manu Ginobili] and Tony [Parker] especially, over the years, have sacrificed and allowed us to keep a team together. Of course, [GM] R.C. [Buford] and his staff have been spectacular keeping the talent level up and searching out gems that maybe no one else knew about or paid attention to. The combination of all those things has worked so we can continue to be a competitive team." Question: Any talk of him coming in here to help in the future, still be part of this? "He's too smart to coach, that's for sure. I don't think we're going to see Timmy going up and down the sidelines much. But I have a notion he will at least listen to being involved, somehow or other, maybe even on a part-time basis. I'm certainly going to hit with everything I have to try to keep him around here as long as I possibly can because he means that much to everyone in the organization." Question: What one thing will the organization miss most with Duncan gone? "I just think the aura that he creates, the iconic figure that he established for us all those years, the security, the safety net, the home plate, the hub of the wheel, all that sort of thing is who he was as a player. Even when he didn't score as many points the last couple of years, people still don't realize how efficient he was defensively. Just look to see where he ranked this last year as an individual player defensively, then you'll figure that out very quickly. "Offensively, people know how to react because of where he's at. He'll move on the court and react when other players wouldn't have a clue, and they'd just be in the way. But he knows where to go. So even though his production stat-wise wasn't the same, we won 67 games because he still was the center of everything we did on both ends of the court; even whether people scored more. So we'll miss that and have to figure it out. Other people will have to step up leadership-wise. That'll be a huge thing for us: Who's gonna step up and be that quiet leader that everybody responds to and respects and feeds off of? Not a lot of people can handle that. So we'll see how that goes." Question: Is there beauty in the way Tim went out? "Everybody's different. People go out at different times for different reasons. This is the way one would always expect Timmy to go out. He's the same person as far as his values and opinions of himself as the day he came in. "I can still remember before his father passed away, [his father] looking at me in the eye and saying that, 'I'm gonna hold you responsible to make sure that when he's done, he's the same person that he is now.' And in that respect, he is. He's grown as a person as we all do through experiences. But his inner core, he was over himself when he came in. And after all these accolades and all this success, he's still gotten over himself. He hasn't changed a lick." Question: Did you try to talk him out of it? "No. I'm so tired of coaching him, he's so stubborn. I would never try to talk him out of anything." "That's a great point. His willingness to allow me and my staff to coach him, and coach him critically, 'You did well. You did poorly. Here's the deal.' That allowed for a lot of success because that set the tone for every other player that's ever come through that door. Because when somebody like him accepts and wants direction and coaching, and responds to it so well, it makes it very difficult for anybody else to go in a different direction. So that was huge for our success." Question: What did he teach you about leadership? "That there are all kinds of leadership. His was a quiet [one]. He doesn't wave a towel. He doesn't give speeches. When he speaks it's for a purpose. Less is more in a sense with him. So when he did speak, it meant something to people. "And he led by example. He had a vision. Everybody bought into his vision. He was accepting. He was not judgmental of people. He didn't even really need to demand because they knew inherently that what he expected was what they saw in him and what he did every day in practice and in games; how he handled a loss, how he handled that loss in Miami in the [2013 NBA] Finals, how he handled that win against Miami in the  Finals. That's who he was and that's how he led." Question: Any games stick out? "No, not really. I remember a pretty neat summer league game when he first came in. [Greg] Ostertag blocked his shot. That was pretty cool."